Development of the military situation in Sinai – Feb. - Egyptian Institute for Studies. Home/Egypt/Sinai/Development of the military situation in Sinai – Feb.
Development of the military situation in Sinai – Feb.
To Read Text in PDF Format Click here. More than one year has passed since the military campaign, codenamed as Operation Sinai-2018, was launched against insurgencies in Sinai, but there is no sign of success, particularly on the security level amid evictions of the Sinai population and destruction of their homes, in addition to many other atrocities committed against civilians. On 29 November 2017, General Abdel Fattah Al-Sisi ordered chief of staff of the Egyptian army to “use all brute force, all brute force” to restore security in North Sinai governorate, in the wake of the Rawda Mosque massacre which took place during Friday noon prayers on 24 November 2017. Sisi then gave his army and security forces a three-month deadline to accomplish mission. 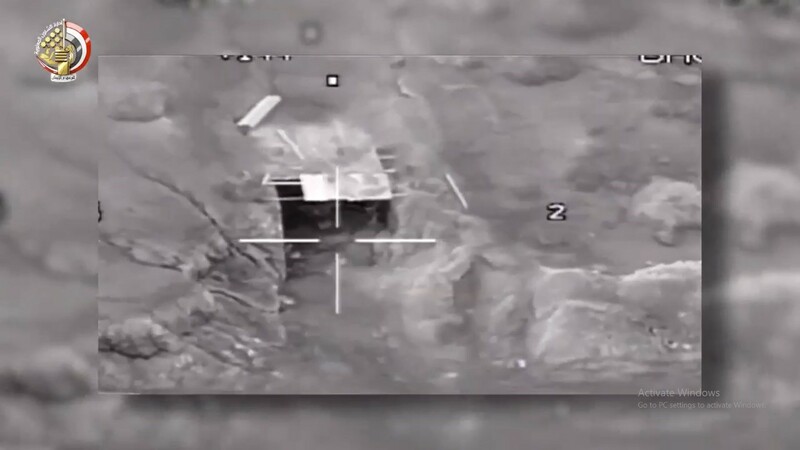 While no more official military communiques on Operation Sinai-2018 have been issued by the military spokesman, Egyptian Foreign Minister Sameh Shukry on 8 January 2019 announced (in an interview with a State-owned satellite channel) that “the infrastructure of terrorist organizations and their ability to operate have been completely destroyed”. Between Sisi’s orders to the army chief of staff to use “all brute force” and Sameh Soukry’s statement on destroying the “the infrastructure of terrorist organizations”, an extremely painful year has passed to the population of North Sinai governorate, where a complete siege was imposed on civilians, amid wide-range arbitrary arrests that almost included everyone there. Thousands of families were evicted from their homes in Rafah, Sheikh Zuwaid, and east and south of Arish, under the pretext of seeking triumph over terrorism. The military spokesman of the Egyptian Army issued two military communiques (1, 2) on developments of military operations during this month, while the Egyptian Ministry of Interior issued one statement on the ministry’s official page on the internet. – one officer and 14 other military personnel were killed or injured. – At least 21 military personnel, including 2 officers, were killed; and at least 2 soldiers were injured. 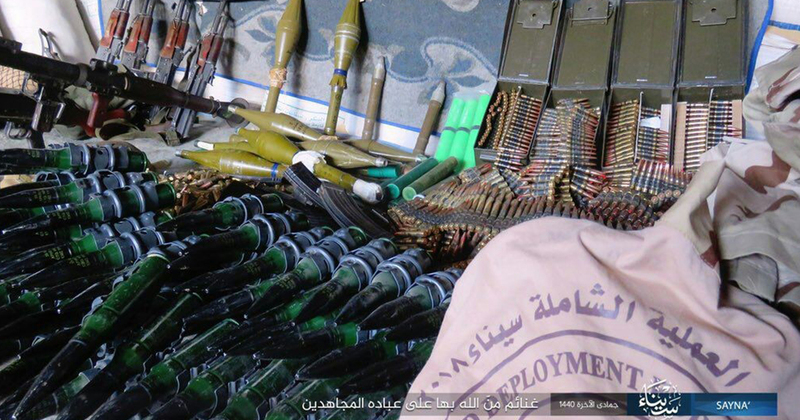 At the level of operations, the IS-affiliate Sinai Province fought two armed clashes against the Army, carried out 6 attacks with sniper weapons, and used 5 improvised explosive devices, resulting in the destruction/damage of 5 military vehicles. The organization also resumed targeting the companies that collaborate with the army in central Sinai, setting 5 vehicles on fire, and seizing a government-owned light truck in El Arish. 1- On February 6, the IS-affiliated organization targeted 4 heavy trucks belonging to contracting companies operating with the army forces in Gifgafa, central Sinai, near Miliz military base located in the area. 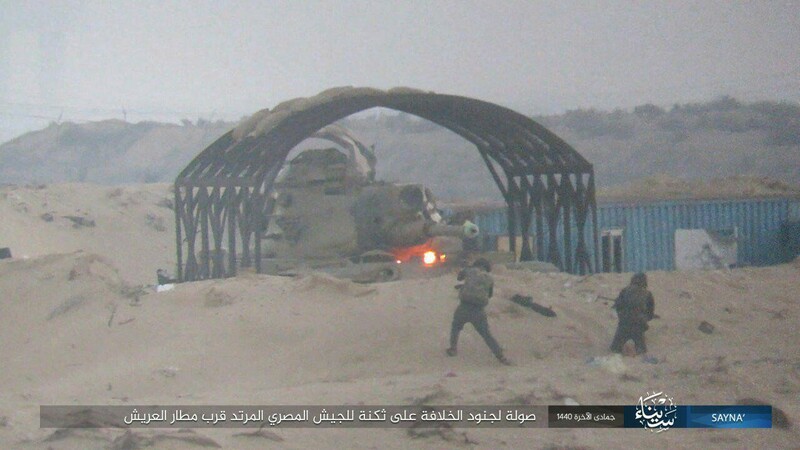 2- on 16 February 2019 surprised the army forces with an attack, the first of its kind to target army forces in the vicinity of the city of Arish about a year since the military Operation Sinai-2018 started in February 2018. The attack that targeted Gouda 3 checkpoint near the Arish airport led to complete destruction of the base, according to a statement released by the militant group’s media arm, the Amaq News Agency. According to the communique issued by Army Spokesman Colonel Tamer Al-Rifaai, the attack took place at 6am and the casualties among the army forces were 15 military personnel, including an officer. “Seven perpetrators were killed and an officer and 14 other soldiers killed or wounded during the exchange of fire,” the military communique said. However, a leaked military document as well as medical sources in the Arish Military Hospital confirmed that one army officer and at least 14 other military personnel were killed in the attack. Subsequent pictures published by the IS-affiliated media showed a new crisis for the Egyptian military institution, which has been shaken so much since it became one of the regime’s repression tools against citizens since Mubarak stepped down in 2011. 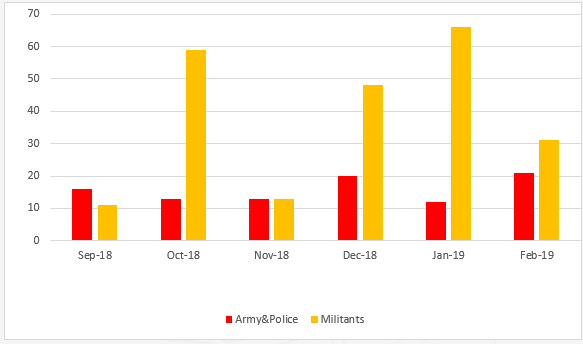 3- The Egyptian regime relied on the air force to respond to the IS attack, carrying out intensive air raids on February 18 (20 raids) and 22 (15 raids). The raids targeted areas of Lefitat, Toumah, Moqataa, Taweel al-Amir, and around El-Arish airport and south of the ring road, south of El-Arish city). 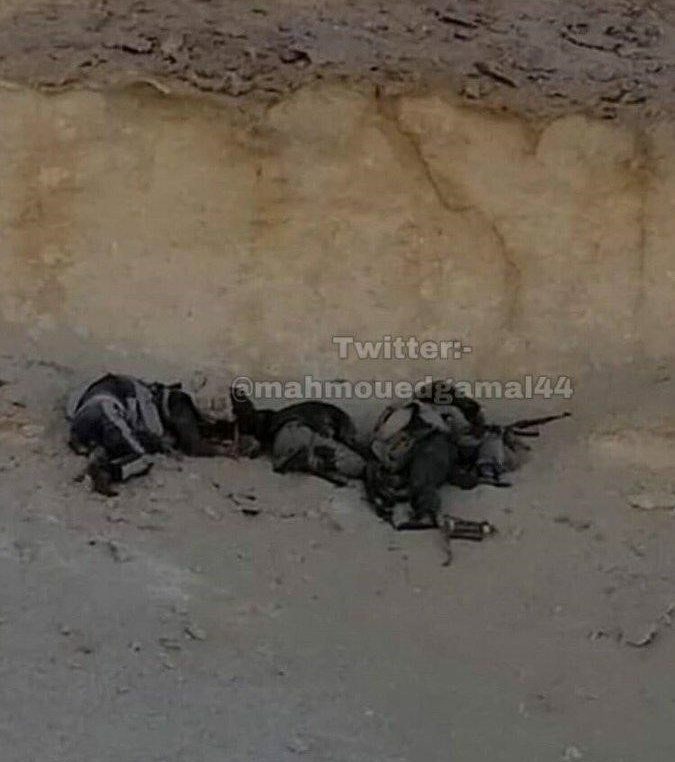 Twitter accounts affiliated to the Egyptian army published photos of the bodies of people alleging that they belong to militants that were killed in some of the raids and clashes that followed the attack of 16 February. 4- Continuation of the policy of physical liquidation of some of the forcibly disappeared, where the Egyptian Ministry of Interior’s National Security Apparatus announced liquidation of 16 citizens on 19 February claiming that they were gunmen killed in clashes during security raids in El-Arish city and its outskirts. 5- The Egyptian Ministry of the Interior continued to restrict the freedom of movement of citizens in the cities of El Arish and Sheikh Zuwaid and the remaining parts of Rafah, while security raids continued in the villages of Bir al-Abed. We were able to confirm only one violation of Egyptian airspace by an Israeli drone on 3 February, where it carried out aerial reconnaissance over the villages of Bala’a and Yamit, west of Rafah. It is noteworthy that intervention of “Israeli” drones in Sinai has been taking place on a regular basis since 2011, and Egypt began to pay attention to the use of these drones since 2016. Development of the military situation in Sinai – Jan.
Development of Security Scene in Sinai – Dec.